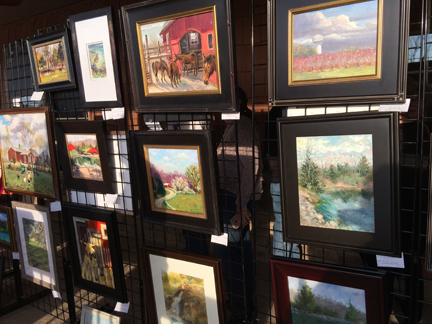 Saturdays April 6th and 13th at 7 p.m.
Sundays April 7th and 14th at 2:00 and 4:30 p.m.
meeting at 12 noon till 1 p.m.
Artists participating in the Augusta Plein Air Art Festival will be painting in and around New Melle on Monday, April 29th. ESTATE PAINT: From 7:00 a.m. to 11:00 a.m. artists will be painting at the residence of Carla and Phil Brakensiek, 20347 Paul Road, Marthasville, MO 63357, owner of Catala Facial Retreat & Boutique in New Melle, followed by judging at 11:00 a.m. A 1st Place $500 purchase prize will be sponsord by Catala Facial Retreat & Boutique. Spectators are welcome to observe the artists paint. FOLLOWING THAT: From 12:00 p.m. to 5:30 p.m. the New Melle Chamber of Commerce and residents will welcome artists to paint in and around the town of New Melle. Registration, judging, and an artists reception and sale will take place at The Quarry Wine Garden, 3960 Hwy. Z. Art created at the morning event will be on display and available for purchase throughout the afternoon. Judging for the afternoon’s paintings will begin at 5:30 p.m. The 1st Place $500 purchase prize for the afternoon paint is sponsored by Peoples Savings Bank of New Melle. INVITE ARTISTS TO YOUR PROPERTY: As in years past, area residents who would like to invite the artists to paint at their property are asked to contact the New Melle Chamber of Commerce so your name and address can be given to the artists. The artists sometimes ask where to find older buildings, vintage vehicles, farm animals, and water scenes. RECEPTION: An art sale and reception will be held at The Quarry Wine Garden that evening. Artwork created during the day will be for sale at the reception. The public is encouraged to attend. Come out and enjoy some food, wine and beautiful artwork created in and around New Melle. Judging will be at 5:30 p.m. Come early to see the artwork as it arrives for display. Artists and New Melle Chamber Members will receive a complimentary glass of wine – courtesy of Peoples Savings Bank. 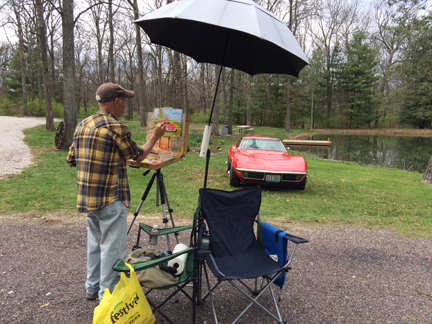 Keary Kautzer Painting a Corvette, 2018. Some of last year’s artwork on display, for sale. Copyright © 2019 New Melle Chamber. All Rights Reserved.